American Society for Psychical Research (ASPR) - The oldest organization in America for promoting research in parapsychology (psychical research is the older term), has lectures in NYC and publishes a "must read" journal for those who want to keep up with the field, the Journal of the American Society for Psychical Research. Association for Transpersonal Psychology (ATP) - The premier organization for everyone interested in spiritual (transpersonal) psychology. Publishes the Journal of Transpersonal Psychology and holds an annual meeting each year with both professional and experiential presentations. Center for Consciousness Center (University of Arizona - Tucson) - Bringing together the perspectives of philosophy, the cognitive sciences, neuroscience, the social sciences, medicine, and the physical sciences, the arts and humanities, to move toward an integrated understanding of human consciousness. Charles T. Tart and Consciousness Library Online - Dr. Tart has been involved with research and theory in the fields of hypnosis, psychology, transpersonal psychology, parapsychology, consciousness and mindfulness since 1963; authored over a dozen books; had more than 250 articles published in professional journals and books. Cognitive Sciences Laboratory - Dr. Edwin May, one of the world's leading parapsychologists, provides valuable information about parapsychology. For over 20 years, the Cognitive Sciences Laboratory has been the center for government-sponsored parapsychology research in support of its intelligence program most recently known as STAR GATE. Consciousness Research Laboratories - Parapsychology information and tests by leading parapsychologist Dr. Dean Radin. Also see Radin's Entangled Minds blog. Deikman, Arthur - Arthur Deikman is one of the leading investigators of the transpersonal. Research on meditation, altered states of consciousness, mystical traditions, and cult behavior with the goal of integrating mystical and scientific knowledge. Esalen Center for Theory & Research - This is the more conceptual branch of Esalen. They hold invited conferences for people working in cutting edge areas and publish proceedings, some on their web site. Material from two invited conferences on research on the possibility of survival of the mind after bodily death is on the site. European Journal of Parapsychology - One of the essential scientific journals for keeping up with the latest developments in parapsychology. Exceptional Human Experience Network - Studies the personal and transformative meaning at the core of all types of anomalous experiences: mystical, encounter, psychical, healing, death-related, peak, healing, desolation/nadir, and exceptional human performance. Forge Institute, The - One of the leading organizations working to bring transformative, trans-traditional spirituality into society. Institute of Noetic Sciences - A membership organization devoted to promoting research and education in areas like alternative medicine, parapsychology, human potentials, creativity. International Association for the Study of Dreams (IASD) - Dedicated to the pure and applied investigation of dreams and dreaming. IASD holds a yearly conference on dreams, presenting both the latest research and experiential workshops. International Association for Near Death Studies (IANDS) - An organization of not only scientists who research near death experiences (NDEs), but also mostly of those who've experienced them. A near-death experience, or NDE, is a profound psychological and spiritual phenomenon that typically occurs during a trauma, health crisis or clinical death, although similar experiences can happen spontaneously in emotionally intense situations or during every-day life. Each near-death experience is unique, but as a group NDEs display common features. By itself, coming close to death without any of these special features is not what is meant by a "near-death experience." International Consciousness Research Laboratories (ICRL) - An international, interdisciplinary, and intergenerational community of scholars who have been associated with the Princeton Engineering Anomalies Research (PEAR) program over its thirty-year history. Works to strengthen the spiritual substance of science by integrating the subjective and objective dimensions of human experience into an expanded 'Science of the Subjective'. This mission is pursued via three primary initiatives in research, education, and applications, each focused on the exploration and representation of the role of consciousness in physical reality. Intuition Network - Offers opportunities for networking among individuals who are interested in cultivating and applying intuition. This networking takes place via phone and fax, newsletters, journals and magazines, radio and television, small group gatherings, conferences in "cyberspace," conferences in hotels, and international travel and spiritual retreats. Journal of Consciousness Studies (JCS) - How does the mind relate to the brain? Can computers ever be conscious? What do we mean by subjectivity and the self? These questions are being keenly debated in fields as diverse as cognitive science, neurophysiology and philosophy. JCS is a peer-reviewed journal which examines these issues. Koestler Parapsychology Unit - Psychology program at the University of Edinburgh, with specialization in parapsychology. One of the very few such programs. Established in 1985, it consists of academic staff and postgraduate students who teach and research various aspects of parapsychology, including: the possible existence of psychic ability; belief in the paranormal; the psychology of anomalous experiences; pseudo-psychic deception and self- deception; and the social and historical relevance of parapsychology. Multidisciplinary Association for Psychedelic Studies (MAPS) - Assists scientists to design, fund, obtain approval for and report on studies into the risks and benefits of MDMA, psychedelic drugs and marijuana. New Dimensions Radio - Weekly and sometimes even more often programs on various aspects of human potential, stimulating and enlightening. Parapsychological Association - International professional organization of scientists and scholars engaged in the study of 'psi' (or 'psychic') experiences, such as telepathy, clairvoyance, psychokinesis, psychic healing, and precognition ("parapsychology"). Parapsychology Frequently Asked Questions (FAQ) - A group of leading experimental parapsychologists collaborated in this basic set of answers to the most frequently asked questions about parapsychology. This is solid information that everyone should know. Parapsychology Foundation - Provides a worldwide forum supporting the scientific investigation of psychic phenomena. The Foundation gives grants, publishes pamphlets, monographs, conference proceedings and the International Journal of Parapsychology, hosts the Perspectives Lecture Series, conducts the Outreach Program, maintains the Eileen J. Garrett Library with its collection of more than 12,000 volumes and 100 periodicals on parapsychology and related topics, and has resurrected its quality paperback imprint, Helix Press. Parapsychology, Anomalies, Science, Skepticism, and CSICOP - A collection of weblinks presenting arguments for and against the paranormal with a critical look at pseudo-skepticism and CSICOP. Princeton Engineering Anomalies Research (PEAR) - PEAR, which flourished for nearly three decades under the aegis of Princeton University's School of Engineering and Applied Science, has completed its experimental agenda of studying the interaction of human consciousness with sensitive physical devices, systems, and processes, and developing complementary theoretical models to enable better understanding of the role of consciousness in the establishment of physical reality. These pages sketch the substance, spirit, and findings of this scholarly endeavor. PSI Explorer - A multimedia website exploring all aspects of psychic phenomena and scientific parapsychology. Red Cairo - Palyne Gaenir's blog on "inexplicable longings, entities, psychic stuff and other things even less respectable." Rhine Research Center - The major research center in the United States, continuing the work started by J. B. and Louisa Rhine at Duke University in the 1930s. Publishes the Journal of Parapsychology, one of the essential scientific journals to read if you want to keep up with the latest developments in parapsychology. Scientific and Medical Network (SMN) - Britain's leading organization to look into and disseminate information about alternative medicine and related spiritual and parapsychological issues. The SMN produce The Network Review - a journal/magazine that is circulated to all members three times a year, containing articles, news and reviews in the realms of: Consciousness Studies and Psychology Holistic and Mind-Body Medicine; Frontier and Paranormal Science; Philosophy of Science; Ecology and Sustainability; and Spirituality and Religion. Skeptical Investigations - Investigations into skepticism in science. Society for Scientific Exploration (SSE) - A multi-disciplinary professional organization of scientists and other scholars committed to the rigorous study of unusual and unexplained phenomena that cross traditional scientific boundaries and may be ignored or inadequately studied within mainstream science. Publishes the Journal for Scientific Exploration (JSE). Sofia University - A leader in transpersonal research and education of clinicians, spiritual guides, wellness caregivers, and consultants who apply transpersonal principles and values in a variety of settings. University of Virginia, Division of Perceptual Studies - The leading scientific research center for topics like reincarnation, out-of-body experiences, near-death experiences and other aspects of parapsychology. The Division's main purpose, and the raison d'être for its foundation, is the scientific empirical investigation of phenomena that suggest that currently accepted scientific assumptions and theories about the nature of mind or consciousness, and its relationship to matter, may be incomplete. Examples of such phenomena, sometimes called paranormal, include various types of extrasensory perception (such as telepathy), apparitions and deathbed visions (sometimes referred to as after-death communications or ADCs), poltergeists, experiences of persons who come close to death and survive (usually called near-death experiences or NDEs), out-of-body experiences (OBEs), and claimed memories of previous lives. Vaults of Erowid - An enormous and comprehensive collection of reference material on psychoactive drugs like marijuana, LSD, etc. 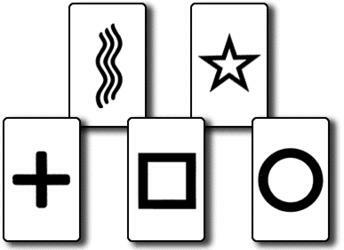 Zener Cards - Cards used to conduct experiments for extra-sensory perception (ESP), most often clairvoyance. Perceptual psychologist Karl Zener (1903-1964) designed the cards in the early 1930s for experiments conducted with his colleague, parapsychologist J.B. Rhine (1895-1980). Also see Skeptic's Dictionary entry on Zener ESP Cards. This webpage last updated on Wednesday, January 6, 2016 6:00 PM.